Last year’s “Justice for Cleaners” campaigns managed to achieve a certain degree of success but the conditions for most of the professionals in the field are yet to improve. 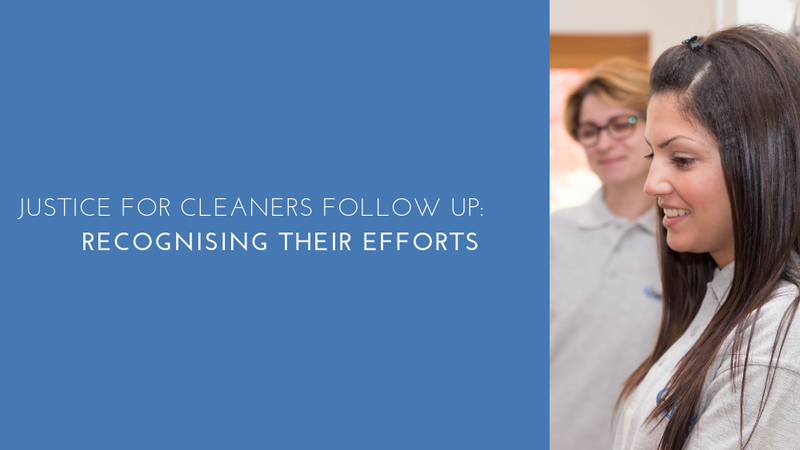 As firm believers in the universal rights of cleaners throughout the UK, FastKlean took a firm stance on the issue, aiming to set an example to other firms in the field, urging them to do more for their employees. Sadly, the situation is yet to reach the desired levels. This means that, for many cleaning workers in the UK, taking on multiple jobs is a necessity. For some, even working at two places isn’t enough and a number of cleaners have been forced to seek three simulations positions, just to make ends meet. In our humble opinion, this is completely unacceptable. Not everyone can handle working two jobs at once, especially if we consider that many of these workers will still struggle to get by. As rep. Maria Echeverria pointed out last year, public institutions need to understand that outsourcing the work should never be used as an excuse for lower wages or exploitative conditions. Yet, for many of the cleaners throughout the UK, they still are subjected to these issues. On the 26th of February, London saw yet another strike from the unappreciated and underpaid workers. This time, the cleaners from the University of London, joined with those from BEIS (Department for Business, Energy and Industrial Strategy) and the Ministry of Justice. The disgruntled workers banded together to demonstrate their disapproval for the abysmal wages, as well as their dislike for the dishonest practices of outsourcing and blatant discrimination. The Guardian reports that this time, the cleaners were joined by a variety of other workers, sharing their plight. Catering staff, security employees, as well as other unappreciated individuals, represented by the Public Commercial Services Union (PCS), came together to raise awareness for the issue. Demanding a living wage, equal terms and conditions as well as an end to the atrocious practice of unethical outsourcing, they marched through London, despite their lack of police permit. “We have the right to earn money, and to the profits that are taken from us. We have the right to a better life.” Demanding fairer treatment, rep Cunalata added that this discrimination should not be allowed to continue and that it’s unacceptable for there to be a side which “doesn’t count”. UVW member Susana Benavides, an ex-Topshop cleaner who recently won a £75,000 compensation for proving that she was dismissed unfairly, also joined the rally. “We are here to show the people in parliament that we are human beings and we are not going to go until we get dignity and respect at work.”, said Susana. The mother of three was fired by Britannia Services Group Ltd, on the grounds of gross misconduct, after she participated in a United Voices of the World protest against low wages in 2016. Susana Benavides, an Ecuador-born mother-of-three was working in the UK as a cleaner on a £6.75-an-hour wage. After using her social media accounts to rile up support for her cause an actively taking part in activism demanding fair living wages for cleaners in March 2016, however, Mrs Benavides was fired as a result of “thoroughly irking” her Britannia Services Group Ltd. employers. With the situation looking rather grim for Susana, the agency took the opportunity to comment that they see her dismissal as justified on the basis of her actions. Judge David Pearl, however, stated that “No reasonable employer would have been acting ­reasonably in dismissing Mrs Benavides in the circumstances.” and the court eventually ended up ruling in her favour. Mrs Benavides commented in front of the tribunal, that the events leading up to, and including, her suspension were “the most terrible” of her life. And even though Susana Benavides won the case and has received ample compensation for the ordeal, the situation for the majority of the cleaners in the UK is yet to see the desired improvements. Cleaning is an important job! A large number of Londoners (business owners are especially guilty of this!) tend to take cleaning for granted. “Well, everyone has clean business premises, and we’ll need to keep ours clean as well”, thinks the businessman. But they rarely stop and think about all the time and effort that goes into the cleaning process. The thought of how many personal sacrifices their cleaners have to make, how chaotic their schedules can be and how stressful the job itself is, rarely crosses the minds of the employers. Even the “simple” personal schedule-switching between “free” time and “work” time, constantly re-adjusted to best suit the customer’s needs can wreak havoc on the mood, productivity and psyche of the workers. With this in mind, is a bit of dignity and respect really that much to ask for? As United Voices of the World member Susana Benavides said at the Tuesday rally – cleaners are no less entitled to proper treatment than any other human being. Appreciate the value that cleaners bring! While cleaning isn’t as demanding of a job as engineering, firefighting or medical practice, it’s not any bit less important for the overall wellbeing of Londoners. If our streets were flooded by garbage, if our homes and offices were submerged in piles and piles of dust, dirt, and rubbish, we’d be in big trouble. Sure, you could just “clean up yourself”, but that has a cost to it too – it takes time, effort and equipment! Isn’t that why professional cleaners are hired in the first place? So that they can do what they do best – cleaning – and provide you with time to do what you do best? In the world that we live in, the only responsible way of demonstrating appreciation and gratitude for a job well done is by paying for the service accordingly. No matter if you’re an engineer, or a computer scientist, or a machinist, or a secretary, or a law enforcement officer, or a teacher, you would always feel underappreciated if you didn’t feel like you’re getting paid what you should be. You’d feel demotivated, you’d be less willing to put in as much effort in your work, and you’d constantly be plagued by worries. Expecting exceptional performance without reasonable compensation is not acceptable! As already mentioned, we, at FastKlean wholeheartedly support the cleaner’s plight. Ever since our company was founded 18 years ago, we’ve strived to provide our cleaners with the best possible working conditions, leaving nothing to chance. In this time of struggle for our colleagues throughout the UK, we can find some pride in our firm stance on decent wages and respect and appreciation for the cleaners. This, of course, has not come without an added cost for our company. Often times, we’ve had difficulties explaining to clients why our costs need to go up, alongside the minimum wage. Once repeat customers get used to a service, they’re very likely to question sudden cost increases. Of course, for some companies, this is a non-issue, as they don’t see a need to prioritise their employees’ well– being and their prices barely budge. And it is precisely because of such companies that rallies like those held in London recently happen. Often, the care of our workers has forced us to operate at a minimum profit, and we’ve had to rely on volume to stay afloat. However, we have not wavered. We will not waver. We believe that the best way to help our fellow discriminated cleaners is by holding our position and refusing to budge by never compromising the wellbeing, safety and comfort of our workers in the name of easy profit. We believe in leading by example, and we aim to continue setting an example in our field. At the end of the day, FastKlean owes all of its success to the professionalism of its workers. Getting this far would never have been possible if it wasn’t for them. And we are entirely dedicated to showing them just how much they mean to us, every day.